Induction heating is a highly versatile technology. Induction brazing is used in various fields such as the automotive, aerospace, electrotechnical and beauty products manufacturing industries. Right now, Frank Kuster - who leads THE LAB is the Netherlands - is soldering professional hairdressing scissors in our best-in-class Applications Lab in Hengelo! Induction heating ensures a high quality joint, which increases the longevity of the product. More importantly, we have just the right system: our EASYHEATTM 8310 induction heating system offers maximum efficiency and flexibility for this application. 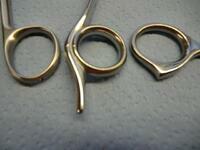 Brazing is one of our most popular applications. We've developed a guide to better brazing, and our induction heating systems enhance manufacturing processes in many plants across the world. There are numerous ways to braze. But induction heating offers many advantages over other methods. Do you have a brazing application that can benefit from our expertise? We've collected an impressive library of brazing application notes - so there is a good chance we've already solved an application similar to yours! Go ahead and . And, when you're ready for an application test, drop us a line, or fill out this convenient on-line Lab Service Request form.